Check-out this article about Salvaged Wood Doors featuring HAUS’ Broad Ripple Bungalow. Designers use distinctive old doors to make a statement in these spaces – Salvaged Wood Doors. A door is just an entry to another space, right? Not in these projects, where the passage into another room is an experience in itself. These homes have converted regular doors into art pieces. Take a peek inside to see how you might use a flea market find, a family heirloom or a souvenir from foreign lands. If you can’t find an antique door you like, you can always recycle wood to replicate the same aesthetic. 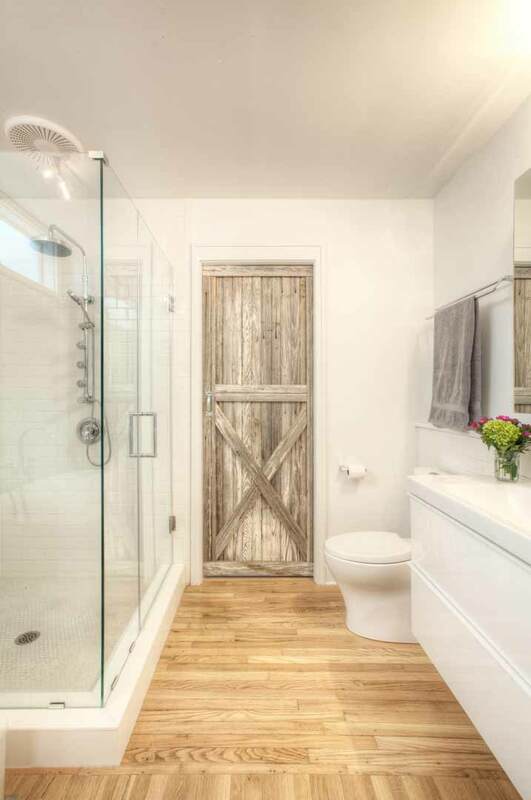 A carpenter was going to fabricate the doors for this bathroom, but the client found a vendor who reworks reclaimed barn wood into doors for about $250 to $300 per door. It gives a nice texture and warmth to the modern bathroom, says Christopher Short, principal architect at HAUS | Architecture For Modern Lifestyles. They were installed with inexpensive barn door hardware. If there is old paint on the doors, people may want to consider sealing them with a satin finish to maintain their rustic quality, Short says. “Using old doors is a great way to recycle while maintaining character of an original historic space, even if they were not originally part of that same structure,” he says.